Streptococcus pneumoniae possesses large zinc metalloproteinases on its surface. To analyse the importance in virulence of three of these metalloproteinases, intranasal challenge of MF1 outbred mice was carried out using a range of infecting doses of wild type and knock-out pneumococcal mutant strains, in order to compare mice survival. Observation of survival percentages over time and detection of LD50s of knock out mutants in the proteinase genes in comparison to the type 4 TIGR4 wild type strain revealed two major aspects: i) Iga and ZmpB, present in all strains of S. pneumoniae, strongly contribute to virulence in mice; (ii) ZmpC, only present in about 25% of pneumococcal strains, has a lower influence on virulence in mice. These data suggest Iga, ZmpB and ZmpC as candidate surface proteins responsible for pneumococcal infection and potentially involved in distinct stages of pneumococcal disease. Streptococcus pneumoniae is an important human pathogen responsible for community acquired pneumonia, as well as meningitis, sepsis and milder infections like otitis media . The principal factors involved in the pathogenicity of S. pneumoniae are the capsule and pneumococcal surface proteins and enzymes such as PspA, PspC, neuraminidase, pneumolysin and hyaluronidase [2–4]. A characteristic feature of S. pneumoniae and other oral streptococci is the presence of large proteases (1800–2001 amino acids) on the cell surface. Except for one serine protease, these enzymes are zinc metalloproteinases and are thought of contributing to the virulence of S. pneumoniae. The published genome sequences show that S. pneumoniae possesses two to four zinc metalloproteinases depending on the strain [5–8]. The best characterized of these enzymes is Iga which cleaves human IgA1 in the hinge region [9–12]. IgA1 protease was found to be important in lung infection and sepsis following large-scale virulence factor identification studies [13, 14] and in in vitro studies performed on epithelial cells . IgA proteases are common to a variety of bacteria, including Streptococcus gordonii, Streptococcus sanguis, Neisseria meningitidis, Neisseria gonorrhoeae, Haemophilus influenzae, Prevotella melaninogenica, Capnocytophaga spp [10, 16–18]. The second pneumococcal zinc metalloproteinase with an assigned function is ZmpC, which was recently shown to specifically cleave human matrix metalloproteinase 9 (MMP-9)  and to participate in pneumococcal pathogenicity in an experimental mouse model of intranasal challenge and sepsis [5, 13, 14]. This role links ZmpC to the group of bacterial proteases  involved in disruption of extracellular matrix and tissue destruction and invasion. No specific function has yet been described for ZmpB , although a knockout mutant devoid of zmp B was recently shown to be significantly attenuated in murine models of pneumonia and sepsis . Molecular epidemiological data obtained through sequencing and probe screening (including microarray) [10, 15, 22] evidence that the pneumococcal, and the related streptococcal, zinc metalloproteinases evolve in a mosaic like fashion. None of these studies links the presence or absence or the variability of these genes to clinical disease. 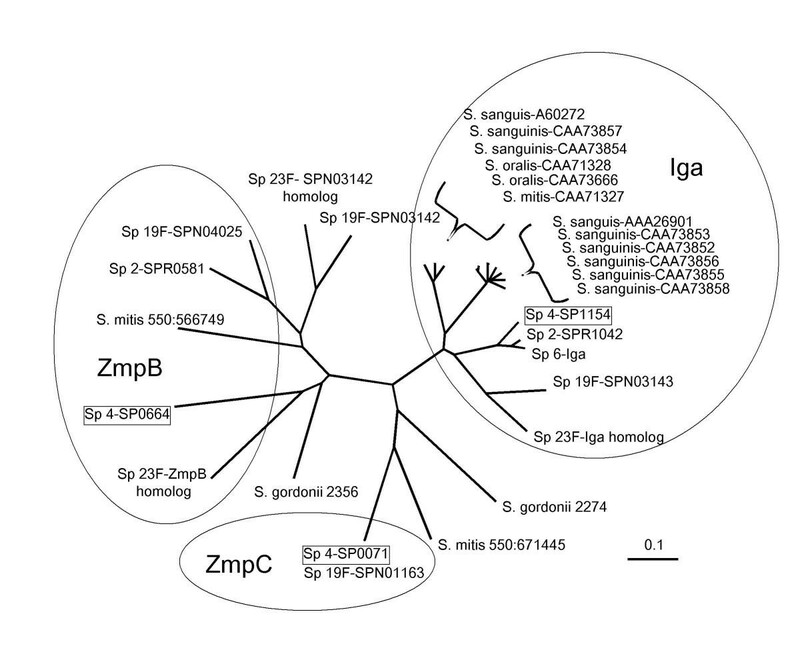 Genome sequences evidence that Iga (IgA protease) and ZmpB are present in three out of three strains, while ZmpC is missing in R6 [6–8]. Our own recent survey of presence of ZmpC in clinical isolates showed that the zmp C gene is present in 26% of strains and that its presence is linked to isolates from pneumonia . Large scale studies, carried out to identify virulence genes in S. pneumoniae, report different results concerning surface zinc metalloproteinases. None of these enzymes seems to be important in a serotype 3 strain virulence , two of them are reported to be important in the virulence of a type 19F strain  and all three appear to play an important role in the virulence of a type 4 strain . In the present work, we conducted intranasal challenge studies, using ten fold dilutions of infecting doses just above the LD50 of the wild type strain, to compare the role in pathogenesis of the three zinc metalloproteinases (Iga, ZmpB and ZmpC) present in the encapsulated S. pneumoniae type 4 TIGR4 strain . For the in vivo challenge SP0071/zmpC, SP0664/zmpB and SP1154/iga mutants of the capsulated TIGR4 strain were constructed by direct transformation of PCR products containing antibiotic resistance cassettes. These DNA products were obtained from mutants previously constructed in a rough type 4 derivative . Parameters relating to transformation efficiency and the specific constructs are shown in Table I. In the case of the ΔSP0071/zmpC mutant FP122 a cat gene (chloramphenicol acetyl tranferase)  substitutes for SP0071 (Table I), in the case of the ΔSP0664/zmpB mutant FP173 the ermB gene (erythromycin resistance methylase B) substitutes for SP0664, and in the case of the ΔSP1154/iga mutant FP174 the spe gene (spectinomycin resistance conferring aad-9 gene)  substitutes for SP0664 (Table I). Neither of the three proteinases genes was observed to be essential for in vitro growth, and no changes in doubling time or final density of the culture were detected in these encapsulated mutants. * all sizes are expressed in base pairs. The total number of transformants obtained transforming 1 μg/ml were 5.2 × 102 CFU/ml using a chromosomal DNA carrying a point mutation conferring novobiocin resistance (positive control). In order to evidence that the three proteinases of TIGR4 effectively represent the major subgroups of streptococcal zinc metalloproteinases a tree diagram was constructed (Figure 1). Due to the mosaic nature of pneumococcal genes [5, 18, 22, 25] and the low conservation in primary sequence between the different proteinases , only a region of 180 amino acids surrounding the proteinase active site was considered when generating the treefile. The diagram in Figure 1 clearly demonstrates that the three proteinases of TIGR4 belong to the three major branches of the tree representing the zinc metalloproteinase of pneumococci and other oral streptococci sequenced so far. Unrooted radial tree of streptococcal zinc metalloproteinases: The tree diagram of streptococcal zinc metalloproteinases was drawn to visualise to which group the diverse proteinases of strain TIGR4 belong to. The major clusters formed by the zinc metalloproteinases of the oral streptococci are circled. The three enzymes of strain TIGR4, whose deletion mutants are assayed in this work, are boxed. Even if streptococcal zinc metalloproteinases evolve by horizontal gene transfer and show evident mosaic like structure, a fact questioning phylogenic analysis, a tree was drawn to show the major grouping of these enzymes. A stretch of 180 amino acids surrounding the active site of the streptococcal zinc metalloproteinases available from GenBank [5–8], TIGR and Sanger Centre were aligned with ClustalX using standard parameters and the tree was visualised using TreeView. S. pneumoniae proteins are preceded by Sp and the serotype. Proteins of the unfinished genomes of serotype 6 (TIGR) and 23F (Sanger Centre) are named as homologs referring to the published pneumococcal enzymes. The proteins derived from the unfinished genomes of S. gordonii and S. mitis (both TIGR) are denominated according to the respective contigs (last accessed January 27th 2003). In order to analyse the role of the three zinc metalloproteinases in pneumococcal disease, groups of 6–12 mice were infected intranasally with 105, 106 and 107 CFU of the TIGR4 wild type strain and the isogenic mutants FP122 (ΔzmpC), FP173 (ΔzmpB) and FP174 (Δiga). As shown in figure 2A, at the dose of 107 CFU survival of mice infected with ΔzmpC and ΔzmpB mutant strains over time was slightly improved with respect to the wild type, although these differences were not statistically significant. The Δiga mutant did not show any attenuation in virulence following infection at the highest dose. 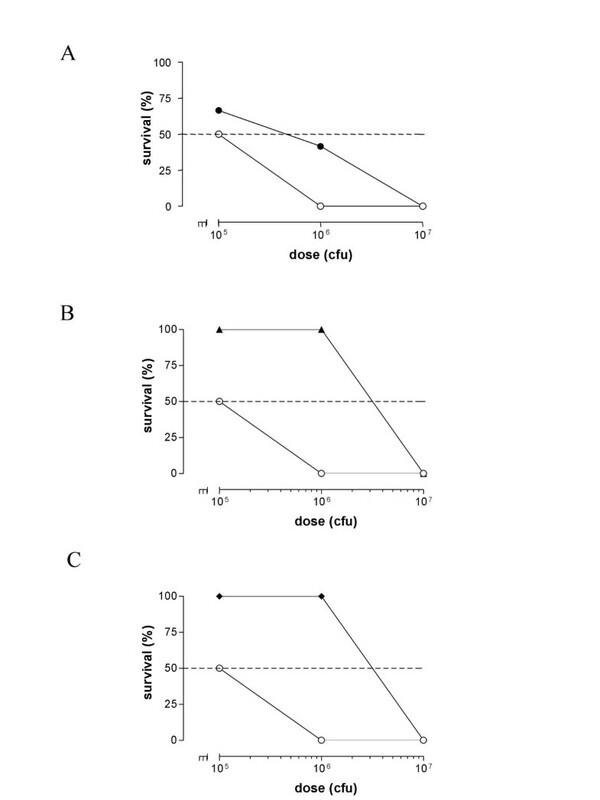 The most remarkable differences were detected at the dose of 106 CFU (figure 2B). The ΔzmpC mutant strain showed a significant (P = 0.002, Mann-Whitney-Wilcoxon test) reduction in virulence over time in comparison to the TIGR4 parent strain  (figure 2B). 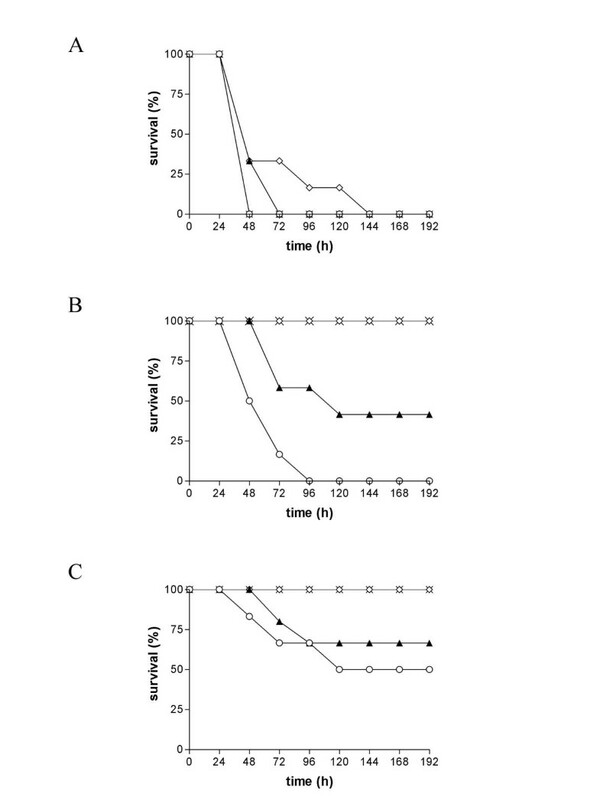 All mice inoculated with the zmpB and iga mutant strains showed no clinical symptoms and were all healthy and alive at end of the study (figure 2B), in contrast to animals infected with wild type pneumococci, which developed sepsis after intranasal infection. Differences in survival were found to be significant (P = 0.0003 for both Iga and ZmpB mutant strains in comparison to TIGR4). Following infection with 105 CFU, survival percentage of mice infected with the zmpC mutant was 66.6% compared to 50% of control mice at the end of the experiment (difference not statistically significant). Also at 105 CFU, no mice inoculated by the intranasal route with zmpB and iga mutants showed any disease symptoms (figure 2C). Differences in survival between mice receiving the two mutant strains and the ones infected with the wild type were not quite significant (P = 0.074). The data on disease outcome at the infecting dose of 106 with the zmp C mutant (filled triangles of Panel B in Figure 2) have been previously reported separately . Virulence of pneumococcal zinc metalloproteinase mutants at different doses of intranasal challenge: Mice were infected intranasally (i.n.) with different doses: panel (A) 107 CFU/mouse, panel (B) 106 CFU/mouse, and panel (C) 105 CFU/mouse. Bacterial strains were TIGR4 (open circles, n = 12 for 106 CFU and n = 6 for 107 and 105 CFU), ΔzmpC (solid triangles, n = 12 for 106 CFU and n = 6 for 107 and 105 CFU), ΔzmpB (open diamonds, n = 6) and Δiga (crosses, n = 6) mutants. Animals were observed for 8 days. Results are expressed as percentage of mice surviving intranasal challenge and subsequent sepsis over time. Statistical analysis (Mann-Whitney-Wilcoxon U Test) was performed considering the time point when mice died (P < 0.01). For statistical purposes, animals still alive after 8 days were assigned a time to death of 192 h. The data referring to the 106 CFU inoculum of the ΔzmpC mutant were already reported in reference  combined to bacteremia levels. Figure 3 shows survival increase of animals infected with IgA protease mutant strains at three different doses. Differences in LD50 between mice infected with TIGR4 and mice infected with the three mutant strains were observed. Infection with zmpB and iga mutants enabled the detection of an LD50 of 3.6 × 106 CFU in MF1 mice (Figure 3B and 3C) while the one observed following infection with the zmpC mutant was calculated as 4.7 × 105 CFU, compared to 105 CFU detected for the parent strain (Figure 3A). This indicates a 36-fold reduction in virulence for zmpB and iga mutants and only a 4.7-fold reduction for the zmpC mutant compared to TIGR4. Significant differences in survival between zmpB and iga strains and TIGR4 were detected at the dose of 106 CFU (P = 0.0022, Fisher's exact test) but not at 105 CFU (P = 0.18). In the case of the zmpC mutant the difference in comparison to the parent strain was significant at 106 CFU (P = 0.037), but not at 105 CFU (P = 0.6). LD50s of mice challenged intranasally with pneumococcal zinc metalloproteinase mutants: (A) Six groups of MF1 outbred mice (n = 12) were infected i.n. with different inocula (105, 106, and 107 CFU) of either TIGR4 wild type strain (open circles) or zmpC mutant (solid circles). (B) Six groups of MF1 outbred mice (n = 6) were inoculated i.n. with 105,106 and 107 CFU of TIGR4 (open circles) or zmpB mutant (solid triangles). (C) Six groups of MF1 outbred mice (n = 6) were infected with different bacterial doses (105, 106, and 107 CFU) of TIGR4 (open circles) or iga mutant (solid diamonds). LD50s are indicated by the dotted line. Differences in survival percentages between the parent strain and IgA protease mutants were statistically analyzed by Fisher's exact test (P < 0.05). LD50 calculation was performed 8 days after observation of survival. Data reported in this figure are taken from the same experiment as those in figure 2. The cell surface is the prime interface between any microorganism and the host. A total of 23 proteins of over 1500 amino acids are present in the three published pneumococcal genome sequences (7–8 proteins / genome) [6–8] and all of these proteins, except one (DNA methylase of a conjugative transposon), are surface located. Out of these 22 large surface located proteins, 12 are proteinases (2–4 zinc metalloproteinases and one serine proteinase / genome), 7 are involved in cleavage of carbohydrates (3 acetylglucosaminidases, 3 beta-galactosidases and an uncharacterised glycosyl hydrolase) and 3 are of unknown function. Extracellular zinc metalloproteinase are recognised to be important virulence determinants of several human pathogens, acting on target cells as intracellular toxins, as in Bacillus anthracis (lethal factor) , Clostridium botulinum (neurotoxin) , Clostridium tetani (neurotoxin) , or as extracellular toxins, as in Pseudomonas aeruginosa (pseudolysin, elastase, neutral metalloproteinase) , Staphylococcus aureus (aureolysin, neutral proteinase) , Vibrio cholerae (hemagglutinin/proteinase, vibriolysin) , and Listeria monocytogenes . Concerning Streptococcus pneumoniae, three studies based on large scale investigations on pneumococcal virulence genes by signature-tagged mutagenesis (STM) are available. They respectively focus on (i) a serotype 19F strain (strain G54) studied in pneumonia (108 CFU of a pool of 50 mutants given intranasally) and septicaemia models (103, 104 and 105 CFU given intraperitoneally) in BALB/C mice , (ii) a serotype 3 strain (strain 0100993) in pneumonia (2 × 107 CFU of a pool of 94 mutants delivered intranasally) and bacteraemia (105 CFU given intraperitoneally) models in Swiss CD1 and CBA/J mice  and (iii) a serotype 4 strain (TIGR4) in a pneumonia model (2 × 107 CFU of a pool of 63 mutants delivered intranasally) in Swiss Webster outbred mice . While Lau et al. did not identify zinc metalloproteinases as virulence determinants using a type 3 strain, both works on a type 19F and on a type 4 strain, pointed out the involvement of zinc metalloproteinases in pneumococcal virulence and pathogenesis. Polissi et al. described strong virulence reduction in a sepsis model of a iga mutant (19F type, the SP1154-homologue of G54 is deposited as SPN03143). However the presence of tandem zinc metalloproteinase genes in this locus (see Figure 1 in ref ) does not allow to ascertain the specific contribution of Iga in virulence reduction. Concerning ZmpC, mutation of this locus in the 19F background, is reported to generate attenuation in a pneumonia mouse model while no reduction of virulence is reported in the sepsis model (the SPN1471 mutant is described by Polissi et al. as mutated in a protease having 40% amino acid identity and 60% homology to pneumococcal IgA protease – values which match ZmpC). Hava and Camilli  identified all three pneumococcal zinc metalloproteinases, using a type 4 strain, as important virulence factors in pneumonia: however the mutants were not further characterized through testing bacteraemia and nasal carriage . Two of the three reports agree on the inability to recover proteinase mutants in mice infected with 200 to 1000 times the LD50 of a wild type strain. This lack of fitness, thus, does not clarify if the loss of virulence might depend on other competing co-infecting clones (increased generation time, lack of cleavage of housekeeping factors etc.) or on the interaction of bacterial strains with host factors (decreased resistance to phagocytosis, impaired adhesion or invasion, impaired cleavage of host compounds etc.). Studies on single proteinase mutants are up to now limited to the description of zmp C mutants in a septicaemia model by Polissi and colleagues  and in our intranasal model . In the septicaemia model the zmp C mutant does not show reduction of virulence , which is in accordance with our observation describing an unaltered level of bacteremia is when intranasally challenging mice with this mutant . The reduced of the number of mice developing sepsis (intranasal inoculum) , has been proposed to indicate that the contribution to pathogenesis and disease of ZmpC relates to an event prior to invasion of the bloodstream. For the other proteinase preliminary data were reported by the groups of Mitchell and Claverys , who found that deletion of zmp B caused a significant reduction in bacteraemia levels and increased survival time following both intranasal and intravenous challenge. The aim of the present work was to characterise in parallel the impact of the mutations in single zinc metalloproteinase genes on pneumococcal virulence. Mutants in all three zinc proteinase genes, iga, zmp B and zmp C, were generated and used to carry out in vivo virulence experiments, after confirming that in vitro growth parameters of mutant strains matched the ones of the wild type. Our intranasal infection animal model  is comparable to other models [13, 14, 32, 33], which describe pneumonia development and subsequent death due to sepsis in mice. Our data show that the two proteinases present in all pneumococcal strains (Iga and ZmpB) [5–8] (Figure 1) greatly contribute to virulence in mice as demonstrated by the 36-fold reduction of mice LD50 (Figure 3). ZmpC (Figure 1), present in only about 25% of strains , has a lower impact on animal survival, considering there was only a 4.7-fold reduction in mutant virulence with respect to the parent strain (Figure 2 and 3). Our data are in accordance with the STM data of Hava and Camilli , who describe the importance of all zinc metalloproteinases on the virulence of serotype 4 TIGR4 strain. Our data in part confirm results of Polissi et al. who report attenuation in virulence of iga and zmp C mutants. Differently, our data do not match the results obtained by Lau et al , who do not describe the zinc metalloproteinases genes as related to virulence. Comparing our data to these studies it is difficult to understand whether these discrepancies depend on the use of different pneumococcal serotypes or on other factors (STM library used, mouse strain, growth media, or size of inoculum). The main conclusion arising from our work is that the use of a variety of doses in infection studies is essential in order to detect the impact of the different extra-cellular zinc metalloproteinases on virulence. This is evidenced by the fact that 100 LD50 were lethal for all animals within few days despite the mutations. The attenuation of the zmp C mutant observed only at one challenge dose (106 CFU) further underlines the importance of the infecting bacterial dose in virulence factor analysis. Altogether our data thus confirm STM data carried out on the same bacterial strain and add knowledge on the impact of the single mutations on pathogenesis after intranasal infection. In order to clarify and compare the impact of three large extracellular zinc metalloproteinases, denominated as Iga, ZmpB and ZmpC, on virulence of S. pneumoniae, we conducted in vivo studies by intranasal infection in mice using knock-out mutant bacteria, and observed disease symptoms and detected LD50s of each pneumococcal strain. Our data show that in this specific disease model IgA and ZmpB significantly contribute to the virulence of the pneumococcus, while the impact of ZmpC is less profound. The present findings propose these proteins as candidate surface enzymes contributing to pneumococcal disease in the lung. Still, an important aspect, not covered by the present work relates to the different and possible multiple substrates of the enzymes. Although the role of Iga was recently linked to adhesion (IgA mediated adhesion) , and the one of ZmpC to invasion (cleavage of MMP-9)  a single disease model may not be sufficient in clarifying their in vivo function. Comparative studies of bacterial dissemination to different organs (mucosa, lung, blood, spleen, and CSF) following induction of different pneumococcal diseases (pneumonia, meningitis and septicaemia) via different routes (intranasal, intravenous, intracerebral), may be needed for the characterisation of the specific role in virulence of the single zinc metalloproteinases. Chromosomal regions with deletions of the three zinc metalloproteinases were amplified from unencapsulated TIGR4 [6, 34] derivatives in which the proteinase genes were replaced with antibiotic resistance cassettes . For in vivo experiments, mutantagenic constructs were transferred into the encapsulated TIGR4 strain and denominated as FP122 (ΔSP0071/zmpC), FP173 (ΔSP0664/zmpB) and FP174 (ΔSP1154/iga) respectively (Table 1). All PCR procedures were performed with the Expand High Fidelity Kit (Roche) to reduce the risk of errors in the extension process. The structure of the recombinant chromosomal locus was controlled in selected transformants by PCR using primers located on the marker, the deleted gene and surrounding conserved segments. In order to evaluate the growth rate of the mutants in comparison to the wild type, FP122, FP173, FP174 and TIGR4 bacterial strains were grown in tryptic soy broth (TSB) without selection and the growth curve was read in a Bonet-Maury Biophotometre (Jobin Yvon, Division d'Instruments, S.A.). Transformation procedures were principally as described previously [5, 34–36]. In brief, cells grown to O.D. 590 nm of 0.05 in CAT/GP were diluted 1/100 in CTM and grown for 30 min. Serial aliquots (4 × 1.5 ml for each time point) taken every 15 min are frozen at -80°C. One aliquot for each time point is transformed using chromosomal DNA carrying a point mutation conferring resistance to novobiocin to assay for the competence of the collected aliquots. The aliquot yielding the highest number of transformants is used for further experiments. The competence for genetic transformation in TIGR4 cells used in this work, to generate the k.o. mutants for the three zinc metalloproteinase genes, was found to be 5.2 × 102 CFU/ml (novobiocin resistant transformants). Phylogenic analysis was carried out aligning protein sequences, since DNA sequences differed too much to permit a comparative evaluation. Due to the mosaic structure of the streptococcal zinc metalloproteinases only the 180 amino acids surrounding the protease active site were used to generate the treefile. Analysis was done by using standard parameters with the freely downloadable software ClustalX ftp://ftp.ebi.ac.uk/pub/software/dos/clustalx/, for alignments and calculation of the trees, and TreeView 1.6.1. http://taxonomy.zoology.gla.ac.uk/rod/treeview.html, for viewing the outputs. Published zinc metalloproteinases were downloaded from GenBank [6–8], while preliminary sequence data were obtained from The Institute for Genomic Research through the website at http://www.tigr.org and from The Wellcome Trust Sanger Institute through the website at http://www.sanger.ac.uk/ (last accessed January 27th 2003). Outbred 9-weeks-old female MF1 mice  weighing 21–25 g were obtained from Harlan Nossan (Correzzana, Italy). Animals were allowed to settle in the new environment for 1 week before performing the experiments, they were caged into groups of 6 and given food and water ad libitum. All animal experiments were conducted according to institutional guidelines. Encapsulated TIGR4 strain and its isogenic derivatives Δzmp C/SP0071 (FP122), Δzmp B/SP0664 (FP173) and Δiga/SP1154 (FP174) were passaged in female MF1 mice as previously described [5, 38]. Passaged bacteria were grown in TSB at 37°C to an OD590 = 0.3, centrifuged for 20 minutes at 1500 g, resuspended in fresh TSB with 15% glycerol and frozen in aliquots at -70°C. Before use, bacteria were thawed at room temperature, harvested by centrifugation and resuspended in sterile PBS. To allow pulmonary infection, mice were fully anaesthetized by intramuscular (i.m.) injection of 1 mg/kg Zoletil (Virbac) and 0.12% Xylor (Xylazine). Doses ranging from 105 to 107 cfu were administered to the nostrils of mice (n = 6–12) by giving a total volume of 20 μl of the bacterial inoculum with a Gilson pipette. Mice were regularly monitored for clinical symptoms (starry fur, hunched appearance, lethargy); symptoms were recorded over 8 days (168 hours), at which point the experiment was ended. Differences in mice survival over time between wild type and mutant strains were statistically analyzed using the Mann-Whitney-Wilcoxon Test, considering the last day of clinical symptoms observation (8 days). A value of P < 0.01 was considered statistically significant. Differences in mice survival percentage at each single dose between wild type and mutant strains were analyzed with Fisher's Exact Test by using GraphPad InStat. A value of P < 0.05 was considered significant. DC carried out all animal experiments, performed statistical analysis and drafted the manuscript. GM constructed all knock-out mutants and performed most molecular biology experiments. TM participated in the molecular biology experiments. FI designed methodology to generate pneumococcal mutants. GP participated in the design and coordination of the study and is responsible for the funds used. MRO coordinated the study, performed phylogenic analysis and all bio-informatic experiments and finalised the manuscript. The work was supported in part by grants from Chiron Corporation (Emeryville, California), the Commission of the European Union (contract QLK2-2000-01536) and MIUR (COFIN 2002). The authors thank TIGR and Wellcome Trust Sanger Institute for sequences available over the web. Sequencing by TIGR of Streptococcus pneumoniae 670-6B was accomplished with support from NIAID / Univ. of Alabama, sequencing of Streptococcus gordonii was accomplished with support from TIGR and sequencing of Streptococcus mitis NCTC 12261 was accomplished with support from NIH-NIDCR. Sequencing by The Wellcome Trust Sanger Institute of Streptococcus pneumoniae Spanish 23F-1, in collaboration with Tim Mitchell and Peter Andrew, was accomplished with support from Beowulf Genomics.